We were up early, refreshed, excited for the day: finish the house and then the Dedication! Aunt Laura and Uncle Jeff collected ALL their little presents to share with friends and my mom remembered grandma’s curtains with the dowels. We passed the gift Bible around to be signed by each one of us. Breakfast was porridge with cinnamon-sugar toast and fabulous fruit again! We did okay with only the men’s facilities to use: I am sure the 40+ high school girls were more careful AND that each one stopped thinking: It’s just me and it’s just this once. Aunt Laura translates my words. Ready to go with lots of presents. Uncle Jonathan had so much fun throwing more Beanie Babies out the bus window. It took us a long time to walk down to the house because I was giving things away with Uncle Jeff and my mom was taking pictures. Circle-up and prayer time was inside the house with the roof on! It was so different from Monday when we were outside standing on the hard clay. Brandon said 1 hour and 15 minutes before the 10:00 Dedication: inside walls had to go up, finish the roof and siding of the roof, finish electric, and clean up. We worked hard and fast but we still made time for fun even while people were gathering for the Dedication and waiting for us to finish. I was sanding the dowel with my new friends so that we could hang grandma’s curtains. Last trip to the house. Last time to say `hi’ to cows from the bus. Walking down the road to the house. Watching and waiting for Dedication. If my people who are called by My name will humble themselves, and pray and seek My face, and turn from their wicked ways, then I will hear from heaven, and will forgive their sin and heal their land. Now My eyes will be open and My ears attentive to prayer made in this place. For now I have chosen and sanctified this house, that My name may be there forever; and My eyes and My heart will be there perpetually. This is about the house, the temple, that Solomon built. We had just finished building Wilma’s house and the pastor wanted to say that the Lord had chosen and sanctified her house and that His name would be here as well as His eyes and His heart. Because of Christ, my mom said, the Holy Spirit lives with us in our hearts, not just in the temple. And God was attentive to our prayers as we dedicated Wilma’s simple, little house. The pastor thanked the LORD for all His blessings: thank you for this day, the sun, the air, for your sons and daughters who worked hard, building this house. I liked this verse very much because it reminded me about the foundation and how important it is to stay close to Christ our solid, rock foundation. After the roots and the foundation, comes the building: the electric, the door, the windows, the siding, the roof, all of these things, just like the things in our lives, are built up in Him. We were giving thanks for the house and the whole experience. Of course, my mom liked the part about `abounding in it with thanksgiving.’ She was `giving thanks’ in her silly way big time during the Dedication. I thank my God upon every remembrance of you, always in every prayer of mine making request for you all with joy . . . For God is my witness, how greatly I long for you all with the affection of Christ. She talked about how her family had come to help Wilma’s family. And although it is very difficult to say `goodbye’ right now: we will see each other again in Christ. We have a very special bond: not in ourselves but in Christ. We came wanting to serve and to bless Wilma but we were blessed which also shows the mystery of Christ and His work in this world. Who has commanded and it came to pass, unless the Lord has ordained it? What she wanted to say, and what Paul translated, was that the Lord will get His work done and that no one can get in His way. In spite of her lack of energy, we came AND He gave her the strength she needed. She was `giving thanks’ that He had over-ruled her for Wilma’s sake, for my sake and for her sake, too. After all the talking, Olivia gave the Bible and Schyler and I gave the keys to Wilma and Bremen put the `Casas por Cristo’ plaque on the house. There was singing, and hugs from Willma for each one, and praying and blessing the house. Of course, there were more pictures, lots of pictures, and more presents and I gave away all the pot holders I had made to friends. It was really fun! I hold the keys on my finger. Placing the Casas por Cristo plaque. Wilma gives me a hug. I give Wilma a pot holder. We were cleaning up and putting the tools in Brandon’s truck and getting ready to go, but the family had made another nice lunch for us: chicken and rice and vegetables. It was delicious. We ate, and talked, and gave thanks, AND played! Uncle Jonathan and Olivia made balloons for the kids and everyone was playing and having fun. It was very difficult to say `goodbye’ but we finally had to get into two trucks to get back to the city because the bus had left us. Images of the house . . . backside. Side curtain with back view. We unloaded Brandon’s tool kit in the Casas warehouse and then Brandon showed us his house: we looked around, drank water, used the nice bathroom, and relaxed. I got to see Heather and Brandon’s wedding picture. Morielle had heard them tell their story. I only know that they met on a Casas’ build in Mexico: how very romantic! Six took kits have to fit in this space. Williston, North Dakota in Guatemala! Brandon and Heather’s house: tools. Uncle Jeff can sleep anywhere! I hang out with Ron and Kay. I take picture of a chair . . .
and of Ron. It was funny! We walked around town, got some ice-cream. My mom and I went shopping a little with Kay and Ron. I bought a very cool basket to put my stash of wool in; and I bought some pretty fabric to make a skirt. Then we took a Tutut home to the resort. The driver let me sit in the front to take a picture. I buy fabric for a skirt. We three in the back of Tutut. I sit in the driver’s seat. Thank you for the ride home. When we got back, all the bathrooms were fixed! I don’t know what the resort workers had to do to fix it—my mom does not want to know—but I was thankful that we didn’t have to wait in line anymore. 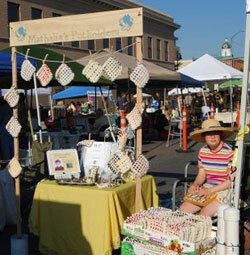 We relaxed; I made pot holders and gave them to my friends, the cooks. Heather brought out the Casas’ t-shirts and things. My mom and I bought t-shirts, nail bags, key necklaces and hats. 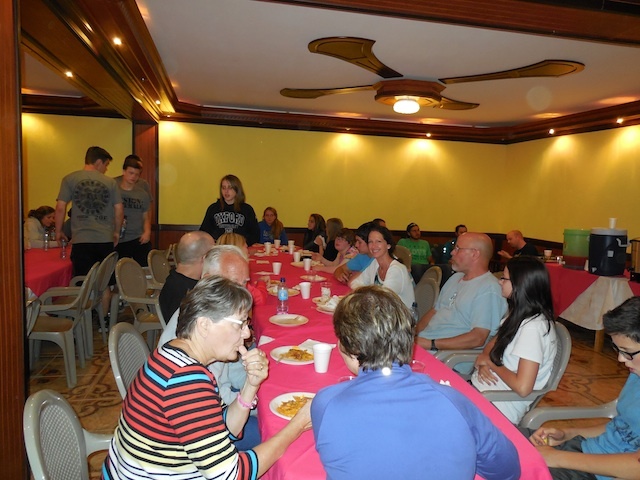 And then we had a delicious enchilada supper with cake for dessert and , of course, Pastor Jeff’s team had lots of singers to entertain us again during dinner. The next day was Antigua so early to bed! Pot holders for the cooks. 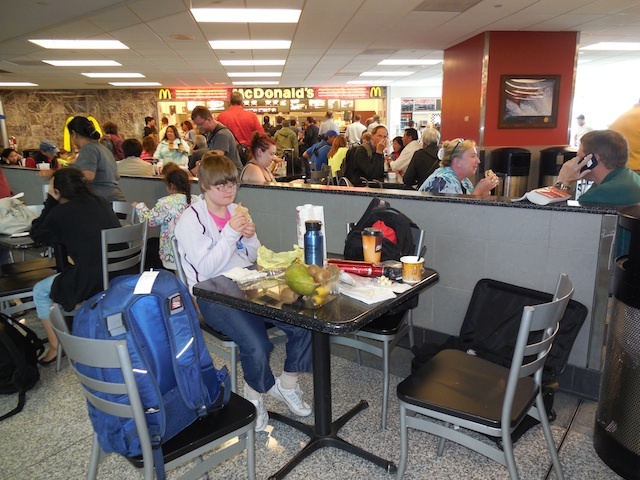 My mom was so excited that she wanted to be in Seattle at 6:00 a.m. on Monday waiting for Morielle but Morielle said `no, you should keep Mathalia’s volunteer schedule.’ My schedule was ushering `Hansel and Gretel’ for MCT Drama Camps. So I ushered all four shows: two shows on Saturday and two shows on Sunday. It was fun! Sunday night I went to bed early because the next day we were off to pick up Morielle and Matthan! 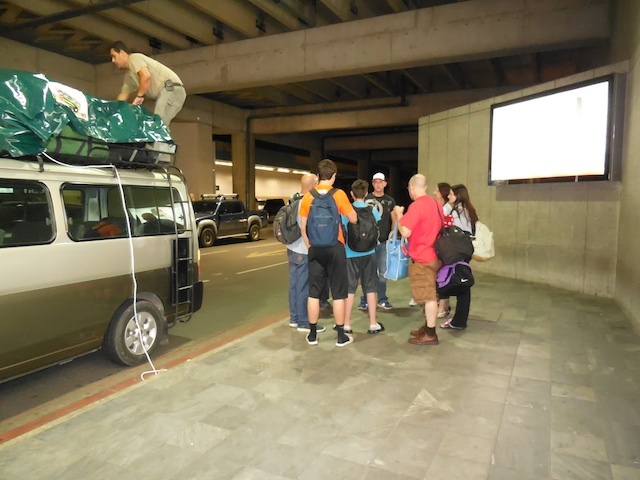 Monday morning we packed our stuff and a little lunch snack and drove to Sea-Tac. We stayed in the same dumpy hotel we stayed in last year on our way to The Netherlands. We got settled into our room and my mom started this endless routine of checking e-mails, talking to Uncle Jeff, talking to Dad, talking to Grandma and Grandpa. 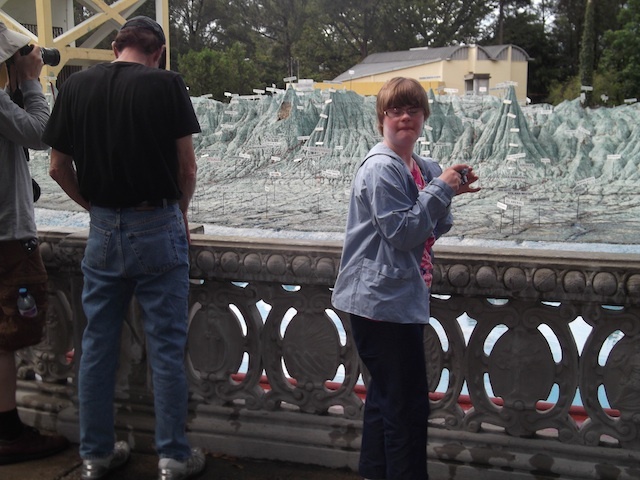 Talking, talking, talking: Where is Morielle? Where was Morielle? Where might Morielle be in the morning? It was crazy. I just wanted Morielle to be here with us! And why not just call Morielle and find out? My mom tried to explain it to me but it was all very complicated . . . something about Morielle’s `smart’ Chinese phone not being so very smart outside of China; she could not call from Tokyo Japan. My mom wanted to get up at 5:00 and go to the airport just in case Morielle was on that flight but Morielle told her not to do that just wait for a call: `I won’t be shy about asking to use someone’s cell phone’ so my mom left her cell phone right next to her bed hoping to get a call from any random phone number. Random photo along the way. Christy’s Henna is still pretty. Tuesday morning: no call from Morielle but lots of emails and talking: Where is/was/will be Morielle: Tokyo? Los Angeles? Honolulu? When will she get to Sea-Tac? Lots of questions, no answers. My mom decided to hang out at the hotel: no visit to the Zoo; no visit to the Aquarium. She said: `We will make our own `fun’ around the hotel today, okay Mathalia?’ Not really a question; more like a statement! I will tell you about our `fun’ day: the hotel only had muffins for breakfast so we went to Safeway to buy breakfast and lunch: I chose Cheerios, English muffins and mozzarella cheese. We ate breakfast on the floor—such a dumpy hotel we did not even have chairs to sit on! More emails, more talking on the phone about Morielle AND about Matthan: the talking about Matthan was not quite as crazy as with Morielle: just wondering when he would get to Seattle from his Green Mountain Summer Internship in Vermont. In between all the talking and emails, we worked through a task list for the day: make pot holders; lunch; Guatemala Dedication Blog Post; go for awalk. Lunch was my recipe of mozzarella cheese on English muffins. It was my mom’s idea to put it in the microwave in the hotel lobby and to make a picnic outside of our room. Yum. It was delicious! After lunch I made pot holders and then we went for a walk. We were out exploring and then my mom got all excited: Mathalia I think we can walk to the airport—we don’t need to get in the car! My mom is silly that way–she thinks the best days are the days not driving a car. So we followed the signs, used the skywalks and walked to the airport. I took lots of pictures along the way. It was fun! 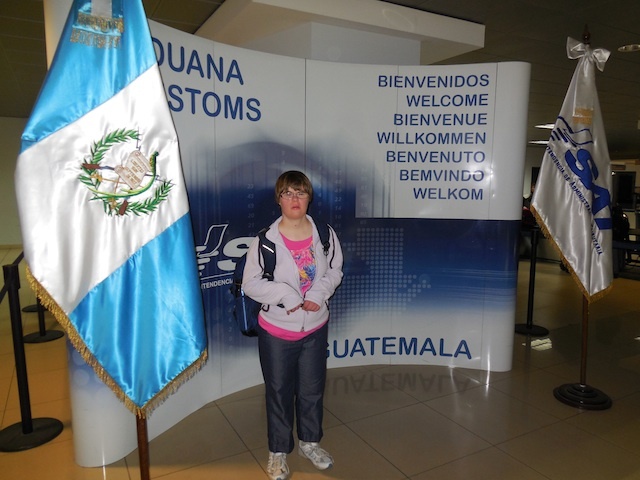 I watched people taking off their shoes and showing passports and it made me excited to remember my trip to Guatemala. I saw a nice woman waiting with flowers. We talked to her and took a picture together. She was waiting for her sister. I told her that I was waiting for my brother and my sister! … breakfast on the floor. We went back to the hotel and relaxed and did the whole talking and email thing again. Somehow we figured out that Morielle was not in Los Angeles; she was in Honolulu; there was a tropical storm; flights had been cancelled; eighty people wanted to get off the island; Morielle was number 80 on the list. Flying stand-by meant that she was having an unexpected Hawaiian vacation . . . but could someone please help her make it SHORT! We also figured out that Matthan might be able to ride on the plane Uncle Jeff was flying but that he should probably try to come earlier because `a bird in the hand is better than one in the hopes and dreams’ as Uncle Jeff says. So later we walked back to the airport but this time there was no time for picture taking and exploring; it was more like being dragged: `Be quick Mathalia! Can you walk more quickly, please?’ We walked around, went up and down escalators, and then we found Matthan: he had lost his cell phone charger which explains the up-and-down and all-around the airport terminal walking that we did to find him. We walked back to the hotel but then we got into the car for a run to Safeway for dinner. We ate in the hotel lobby where they had chairs, a table and the microwave. Back to the room and with more emails and text messages but this time it was about Uncle Jeff. What a CRAZY day but at least we got Matthan out of the deal. We got up early ready to eat breakfast, get our stuff together and get on the bus. Everything was fine except . . . some of the women’s toilets were clogged up. Oops!! So we had to wait in line which slowed us down a little. But then we were off on the bus. The night before Brandon had given us the okay to start handing out a few little gifts and playing with the kids more: `we are almost done with the house and we can take time to relax a little more.’ And so we did! Aunt Laura brought her puppet `Jose’ and some Beanie Babies that Grandma had given her to give away. Oh, everyone had so much fun throwing them out the window to cute little children that we saw on the way. And I got to talk to Aunt Laura’s puppet while we were riding the bus. Uncle Jonathan was good a throwing Beanie Babies out the bus. It was fun to watch the mother and the baby be surprised that it was not trash coming out of the window. Uncle Jeff had lots of cool stuff from his hotel overnights and he had fun passing things out as we walked to the worksite. Circle up and prayer time: `today we work hard on the siding, the rafters and roof.’ Kay volunteered to help Heather with electric and then we all got to work. I tried to nail; I tried to hammer; I tried to measure; my mom tried to find a good job for me. There was a lot going on: Ron, Brandon, Uncle Jonathan were up high working on the rafters; Olivia, Aunt Laura, Leah, Schyler Uncle Jeff were measuring, cutting and putting up siding; Bremen and Renee were working on the side of the house and getting frustrated because something was not quite right; finally, they figured it out and fixed it. I tried this and that and in the end I helped with cleaning up the mud and helping Heather with the electric. She also asked me to put on the washers and nuts so that the house would not blow down in a storm. I did this little job all by myself. She said it was VERY important. My mom took lots of pictures . . . silly mom. The floor was muddy and messy with lots of wood, trash, crooked nails and things so my mom and I picked up stuff, sorted out the good things, threw away the trash, and emptied the mud at the side of the house. Uncle Jeff said that this was important work too. In between I handed things up to the people working on the rafters: Brandon, Uncle Jonathan or Ron if they needed something from the floor. It was fun because I got to climb the ladder. And then all of a sudden Paul came! He had found us: first he went to Pastor Jeff’s house and then they told him how to get to `Uncle Jeff’s’ house. It was so nice that he came because he wanted to help us build and we needed the help. Paul jumps right in to help. Uncle Jonathan on the rafters. Heather and Kay on electric. Brandon hands me the nuts and washers. I bolt the house to the floor. Thank you for the snack, Wilma. Uncle Jeff and Paul try to get it right. Brandon takes a break too. Thank you, Wilma, for the nice lunch. See my mom’s wipes in the corner? After lunch I took some pictures, and helped a little with the work but I also set up another little table to play Memory with my new friends. And then my friend Julie started teaching me Spanish! It was great fun and I really do want to learn Spanish. I had a little in Middle School but now I really want to learn the new words so that I can talk to new friends. My mom set up about four games of Memory. Leah, Olivia and Aunt Laura were taking lots and lots of pictures and having lots and lots of fun with our new friends. A good day’s work and a good day’s fun . . . but back at the resort we found out that ALL the women’s toilets were clogged up! `Yup,’ it did not surprise Brandon, `everyone thinks: oh I just forgot this one time—one little bit of toilet paper won’t matter.’ Well, when everyone thinks that way, we now know what happens! So the men let us use their facilities and my guess is that everyone was more careful. In the evening after supper we circled up in the ladies’ bedroom because it was raining. 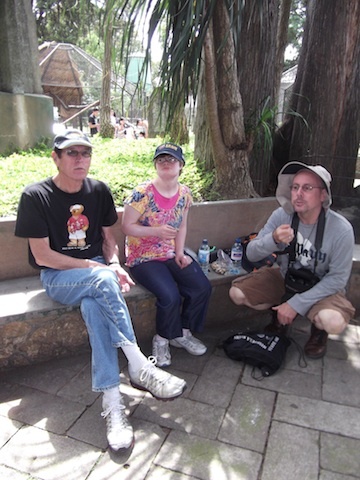 We talked about the day and how very grateful we were for Paul coming to help us and for all the relationships we were forming. Renee talked abut the Body of Christ: For as the body is one and has many members, but all the members of that one body, being many, are one body, so also is Christ. . . . But now God has set the members, each one of them, in the body just as He pleased. . . . those members of the body which seem to be weaker are necessary. . . . the members should have the same care for one another.’ I remembered Brandon’s prayer at the beginning about giving thanks for each one in the group brought here for His purposes. And I remembered the advice my Grandpa gave to me and my mom: `the house will get done by the strong workers of the group; be sure that you take time out to get to know the family and play with the children.’ At the time he said this I did not know what he was talking about but now I know: I was making friends with the children; they were teaching me Spanish! 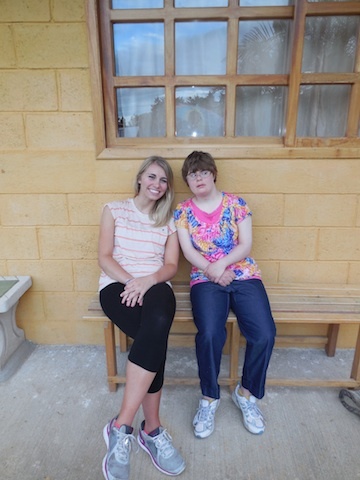 Aunt Laura was building relationships and working on her Spanish too! Each one of us was a necessary and important member of the group. `God has set the members, each one of them, in the body just as He pleased.’ Ron said that he had joy watching my Spanish lesson and I had joy watching the house come together: `I build a house’ . . . well God builds the house; He uses His people to get His work done. I hope God had joy watching His people build the house all together; certainly `He gave us all joy in our hearts’ as we were working. Guatemala Part Three: the walls go up! Monday night it rained and rained and rained—what a noise on the roof of our little room. I was so tired that I slept right through it and would not have noticed at all except that my mom got me up to go to the bathroom. We used the men’s facilities because they were closer ;-). When we got back and went to bed, she was rearranging her bed because she said her pillow was in a puddle or a puddle was in her pillow or something like that. I was not paying much attention because I was so tired. In the morning there were puddles everywhere outside but I did not see any puddle around her pillow . . . and she wasn’t even sure maybe she was dreaming but, no, her pillow was a little wet but not too bad. Anyway, the next night she changed beds and then her pillow was fine. 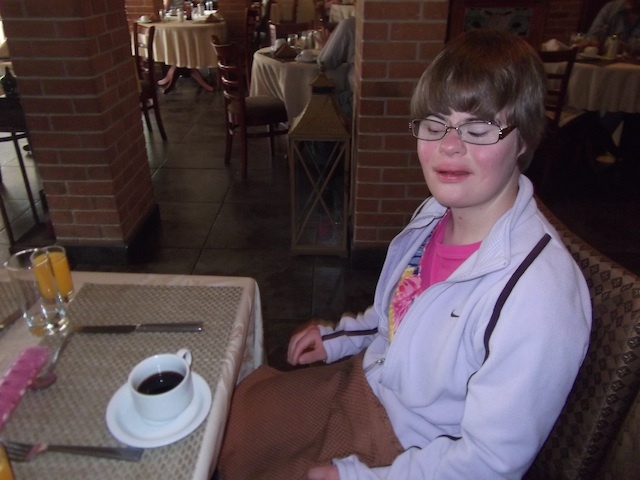 We had a great breakfast of scrambled eggs and lots of wonderful fruit again and then we were off to the worksite. It was muddy and very slippery going down all those hills and I definitely needed help; again my mom abandoned me to take pictures along the way. I eat breakfast with my cousins. Ron asks to hold a little one . . .
No, I stay with my mom. Friends old . . .
. . . and young greeted us. Ron helps me on slippery path. I could not go down that last little hill to the worksite because it was just too scary and slippery. Brandon and Raimie made steps for me which was really nice AND it made going up and down easier and safer for everyone not just for me. We walked on the cement we had poured on Monday. Brandon called us to circle up and pray for the work of the day: we would make the walls and dig out the porch and pour a little more cement to make a porch. Uncle Jonathan started cutting boards again and the wood was going up and down but I just could not help with taking the boards down to Uncle Jonathan and then back up to the cement floor because of the slippery mud so I worked with Kay and we dug out the mud in the front of the house so that it would be level when we poured the cement for the porch. I helped fill the buckets and Kay took my buckets and dumped them at the side of the house so that there was more space to walk beside the house. It was fun work until we got all the mud out and hit hard hard ground. Then we had to ask for help from Uncle Jonathan and Ron: they chiseled away the hard clay and then we were able to shovel the loose dirt into buckets. I can’t get down the muddy slope. Brandon and Raimie make stairs for me. Ron helps me down the new stairs. I shovel mud and dirt into buckets. Kay dumps my buckets along the foundation. Uncle Jonathan chisels out the hard clay. Ron cleans cement off the foundation’s 2x4s. Olivia carries the boards up and down the slippery slope. In the meantime, everyone else was helping to make the walls–wow that was fun to watch: after measuring, cutting, pounding in the nails; each one grabbed a corner and lifted up the wall and walked it over to the side to make room to make another wall and then Heather started snapping lines and drilling holes and the walls started to go up. It was exciting: `I build a house!’ When the ground got too hard, I tried to find another job but we couldn’t find anything for me to do, so I took a little break. … the walls go up! Uncle Jeff brought a memory game so my mom found some clean pieces of wood to make a table and she found a piece of wood for me to sit on so I didn’t have to sit in the mud. Then she invited the kids to learn a new game. We had so much fun! They liked to look at more than two cards AND they would put the cards back in different places so it was crazy trying to find matches and a game of 5 matches took a long time because the cards kept changing places on the board. It was funny! I take a pot holder break. I play Memory with friends. We took a break for lunch: Guatemalan spaghetti with delicious homemade cheese and fresh tortillas with salad. Yum! Aunt Laura, Olivia, Leah, Bremen and Schyler had a lot of fun taking pictures and playing around with new friends during lunch. After lunch we finished preparing a level space for the porch and we started to make cement again. Memory games had to stop because they needed me to fill cement buckets again. May I use your phone to take a picture? Now, we want to see the photo! Why do you call be Lord, Lord and not do what I tell you? Everyone who comes to me and hears my words and does them, I will show you what he is like: he is like a man building a house, who dug deep and laid the foundation on the rock. And when a flood arose, the stream broke against that house and could not shake it, because it had been well built. But the one who hears and does not do them is like a man who built a house on the ground without a foundation. When the stream broke against it, immediately it fell, and the ruin of that house was great.’ He talked about how hard we worked on Monday to dig the foundation, to make it level, to reinforce it with re-bar, to use a strong recipe for cement. We all worked hard on the foundation to make it straight which will make it easier as we build the walls and roof; with a good foundation, it is easier to make everything line up and be strong and look nice. So it is with Christ as our foundation, our rock; He is strong and level and sure and when the winds come, our lives will remain upright because the foundation holds us steadfast. Our lives are built close to that foundation: reading the Word, listening to it preached and taught; and obeying in our daily lives. The foundation will hold us safe when the winds of life blow. 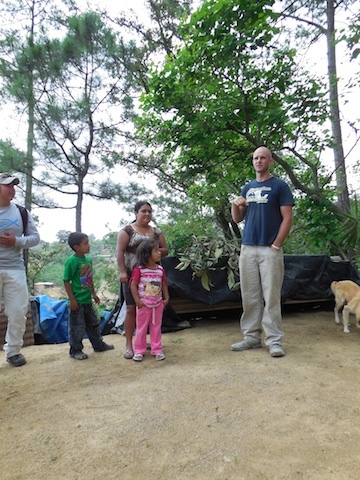 Then he shared a little about his own story—how he never would have dreamed that he would be serving as a missionary in Guatemala building houses for families in need. He had always wanted to serve the Lord but he didn’t see how he could do anything. He felt ill-equipped for any type of work. And yet . . . God had plans for him. `Now I am living and working in Guatemala. If I want to spend time in the Word before I get to work and meet the teams at 6:30, I need to get up early. Some days it is really hard but I have learned that it is VERY important that I start my days close to my foundation in reading, listening and prayer. And so it is for each of you in this group,’ he said. `God has plans for you AND you will want to stay close to Him as the walls go up and the windows and doors are placed in your lives. Your life won’t be perfect and the house we are building won’t be perfect but the foundation is secure and it will last a long time; and most importantly Christ is our steadfast foundation and He will last forever.’ I am sure that my mom was thinking about me and about all the other young people: Schyler, Leah, Olivia, and Bremen. Each one of us has the future ahead of us. I know that I will never forget the day we prepared the foundation and poured the cement for that house: it was hard but fun work and it was so exciting on Tuesday to see the walls go up, `I build a house.’ Well, really God is building the house and He is building our lives. May we all stay close to our foundation by listening and obeying Him. Getting ready to pour with Bremmen. All cleaned up and ready for supper! My mom made me get up very early Monday morning—6:00—because she did not want anyone to be waiting for us. As it turned out there was nothing to worry about. We were ready to go long before the bus left. I was ready at 6:30 for a nice breakfast of pancakes with peanut butter and syrup and lots of fabulous fresh pineapple and papaya! We brushed our teeth with bottled water, packed our tools, snacks, camera, wipes and toilet paper, trying to think about everything we might need for the day. Then we loaded Brandon’s truck with his `tool kit.’ `Tool kit’ means lots of shovels, picks, 2 cement mixers, table saw, circle saw, etc. etc. Leah is in front of the line. Oops!! Daisy can’t eat people food. Uncle Jonathan loads the truck. Ready! No one is waiting for me! Then we loaded up into our school bus—we did not actually leave until 8:30. We were packed into a bus with Team A and Pastor Jeff’s Team form Aloma Church, Orlando, Florida. We dropped off Team A and then the other group and then headed to our site. The bus could not take us all the way down to the place because the road was steep and narrow so we walked down the path. I was glad for my new friend Ron because he helped me walk down the steep road; my mom sort of abandoned me taking pictures like crazy: lots of beautiful scenery, interesting houses, and curious on-lookers. …and a not so nice house. Lots of people are curious. while mom takes pictures . . .
. . . of cute kids. Brandon introduced us to the family we were going to build a house for and then we had our circle-up prayer and plan of the day. 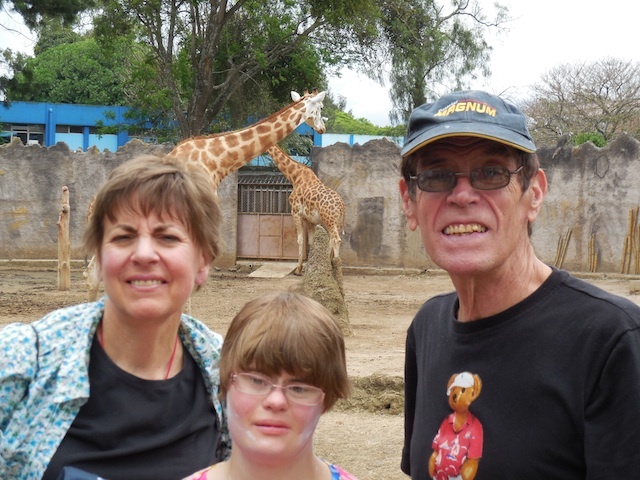 Prayer for the day: Dear Lord you know that you have brought each team member here for Your purposes; and that you have chosen Wilma’s family for this particular house built by this particular team of people. We thank you and we ask that you would do your work IN us while we work and interact with each other and the family and THROUGH us as we build a house for this particular family and neighborhood. For some reason this prayer got my mom going again: silly mom. Maybe the acknowledgement that God had certainly brought us both here in spite of my mom: she was so tired and worn out by all the activity of my Senior year, the emotions of my Graduation, and her worries about my Adult Life that she thought she couldn’t do it and almost cancelled both of us. Anyway, Brandon went on to explain the `plan of the day’ which helped distract her and get her busy with the tasks at hand: unload the tool kit from Brandon’s truck, dig out and level the area, assemble the frame of the floor and footings, set the re-bar, make the cement and then pour the floor and footings. Brandon introduces Wilma, Julie and Frandi. We pass the kitchen area. Aunt Laura and Olivia unloading the truck, bathroom in the background. Ron helps me get down to the work site. I helped with leveling the dirt, putting dirt into buckets and sometimes I helped with chiseling. It was very hard to chisel. I had to be strong to lift the chisel and I had to be careful not to hit my toes or anyone else’s toes with the chisel. It was fun. When things got really intense with the preparation of the footings, I took a little break. Then Wilma and friends and family made us a wonderful lunch: chicken-leg soup with tortillas and a delicious salad. Tools unloaded and ready to work. Aunt Laura and I handing boards down to Uncle Jonathan . . .
. . . and back up again with Leah. Chiseling the hard dirt . . .
. . . to make it level.
. . . see me up in my perch. After lunch we circled up and Brandon said: listen up guys, I have seen this take 1.5 hours or 4 hours. It is up to you what you want it to be: stay focused on your task; take water breaks as you need to; but don’t slow or stop the cycle of the cement recipe: 3 buckets of gravel, 3 of sand, 1 of cement and 3/4 of water; then mix it, pour it, level it out; then screed it. Heather suggested that my mom and I prepare the cement buckets. We had two buckets and we had to keep them filled. She showed us how to cut the bags and not spill too much cement on the ground. Listen up: 1.5 hours or 4 hours. And the recipe is . . . Trained and ready to get started! It was really fun! We all worked really hard: the sand and rocks were down below and had to be carried up to the worksite; the water was in big barrels and buckets had to be filled from those barrels; we had to fill the cement buckets about ¾ full; we all had to work together keep the two cement mixers going all the time! It took us 2.5 hours which was pretty good since we had such a small crew—my mom wanted to take a bathroom-water break: nope we just had to push through; well we were able to drink a little water but only when both cement buckets were full but no bathroom breaks! It was nice to feel so very useful: if we had stopped filling buckets with cement, the work would have stopped. Uncle Jeff knows the recipe! I have to keep up with him! Ron raking and Heather screeding. Schyler knows the recipe too! I stuck with it to the end! We cleaned up the tools with lots of water and smoothed out the cement. Uncle Jeff wanted me to do the edges but there was no time: our bus was waiting for us. It came about 5:00 and took us back to the resort just in time to take a shower before supper. Brandon and Heather stayed two more hours after we left in order to finish up and then after that Brandon had to help another leader with his truck—I think it was sliding down a mountain! I am not exactly sure what happened but I do know that Brandon was very tired Monday night so we skipped our group devotions which was a good thing because I was very tired too and wanted to go to bed early. On Friday, June 21, I got up at 4:00 a.m. put on my airplane clothes, brushed my teeth and packed the last minute things like my toothbrush, retainer and glasses case. I did not forget them. My mom said that on airplane trips, you cannot turn around and go home to get the things you forget as I did on our Spring Break trip which was a road trip. On road trips it is okay to turn around and get the things you forget but not on airplane trips—you just have to do without. So this time I remembered! In Denver we ate breakfast at McDonalds and then my mom thought we had all the time to lounge around making pot holders before our flight to Houston but then we heard the announcement and it was rush rush rush. I guess she got mixed up on the time change. Anyway, the flight was funny because there was a little T.V. on the seat in front of me and I saw `The Incredibles’ on it and then the flight attendant gave me a nice warm cookie for a snack. Yum! No one else got a cookie so I was lucky. As we were landing, I was hoping we would see Uncle Jeff in Houston and there he was waiting for us when we got off the plane! We ate dinner, talked to grandma on the phone and looked around the airport and found the little George Bush museum. 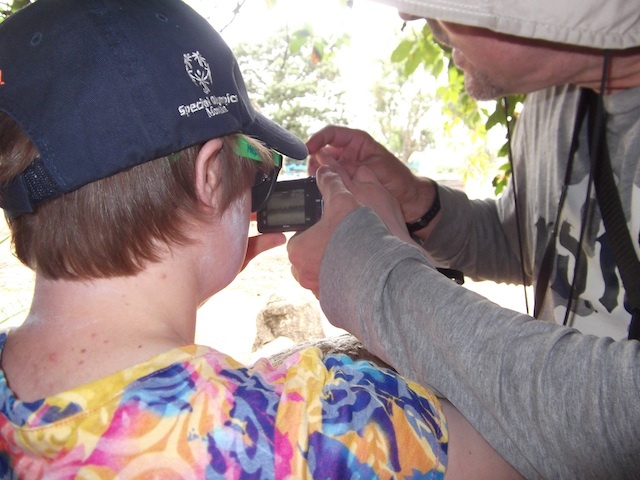 It was interesting to me because there was photo of him signing the Americans with Disabilities Act on July 26, 1990. I have seen this picture many times in my life. 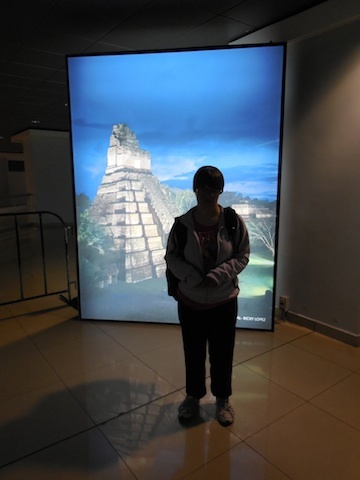 Then we took our last plane to Guatemala! Okay three airplanes were all done and we were tired!! At the airport we filled up our water bottles and got some Guatemalan money called Quetzals not dollars. Uncle Jeff called it `funny money’ and then we found the Howard Johnson’s hotel van and the driver drove us to our hotel. They gave us three bottles of water and my mom asked for more!! She drinks a lot of water. So that was the beginning of brushing my teeth with a water bottle instead of water from a faucet. 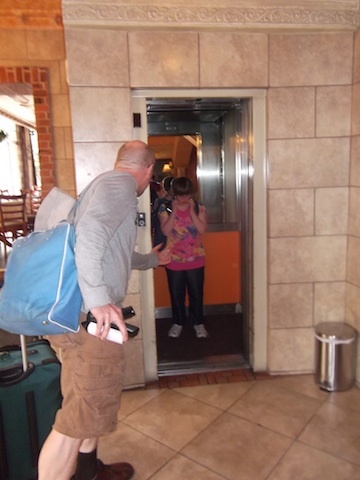 AND it was the beginning of no more elevators for me: Uncle Jeff put me on the little elevator all by myself and the door did not open. It was funny and it was just too scary so since then I have been taking the stairs. The room was really beautiful! And we quickly took a shower and went to bed: 12:00 midnight. About 20 hours earlier I had gotten up out of my own bed in Missoula and now I was going to sleep in a very fancy hotel in Guatemala. The adventure had begun! Cool picture riding in the airplane. 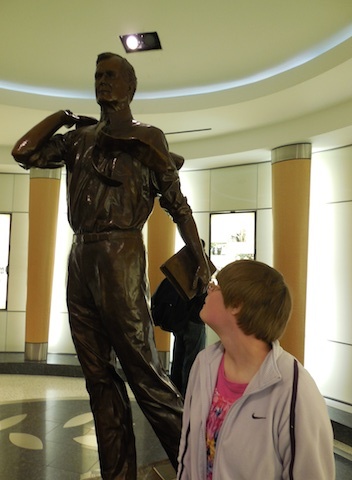 Visiting the George Bush museum at the airport named after him. And more welcome . . .
. . . and very warm welcome! I got stuck on the elevator. Whala . 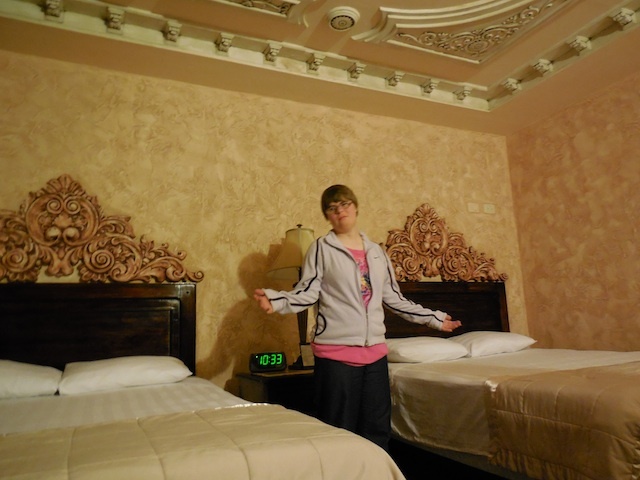 . . what a nice hotel room! Saturday morning we had a very nice Guatemalan breakfast. I even tried some coffee. My mom thought she was playing a trick on the waiter when she traded her coffee cup for mine and asked for another cup hoping it would be fresher and hotter. I just went ahead and took a sip of luke warm coffee which is a very adult thing to do! So far I am not a fan but maybe I will grow into it. 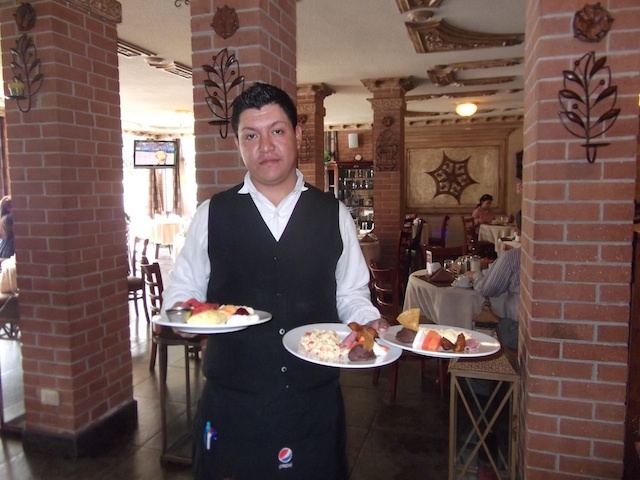 Our first breakfast in Guatemala. I take a picture of my mom and Uncle Jeff at breakfast. My first cup of coffee! My mom’s friend Paul came to see us. He was my mom’s professor at Michigan State and now he lives in Guatemala. He had met Morielle when she was a baby and he was excited to meet me as an adult. He gave my mom a book; he gave me a map; and he gave all of us a plan for the day! It was really fun! 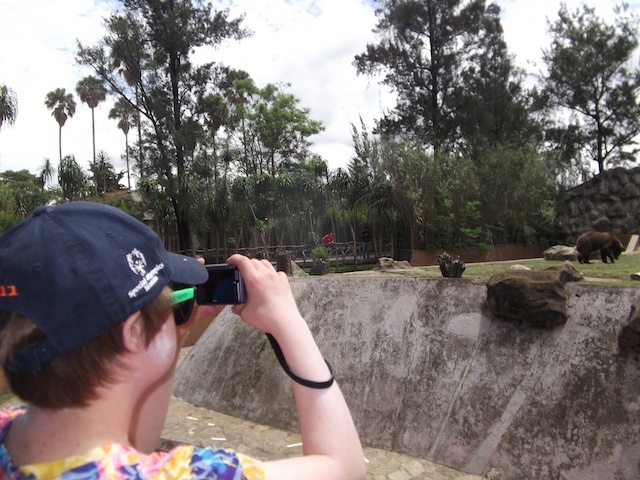 We went to the Guatemala City Zoo and saw lots of animals: a white tiger and some penguins and some very pretty flowers. 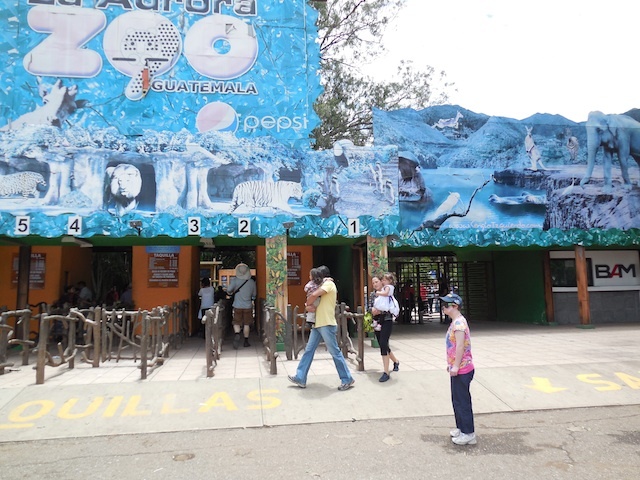 Then we went to see a real map of Guatemala which was very interesting. It showed all the rivers and mountains. 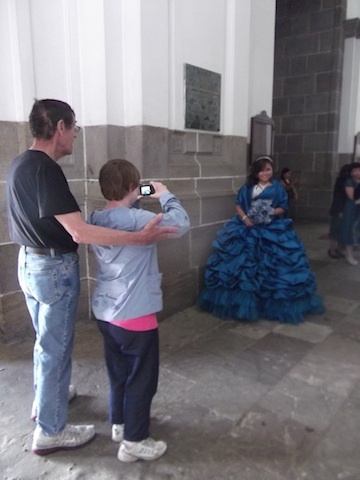 Then we walked around the city and visited a pretty church and I saw a pretty girl all dressed up in a pretty blue dress. Paul said that she was 16 and that it was her `coming-out’ party. 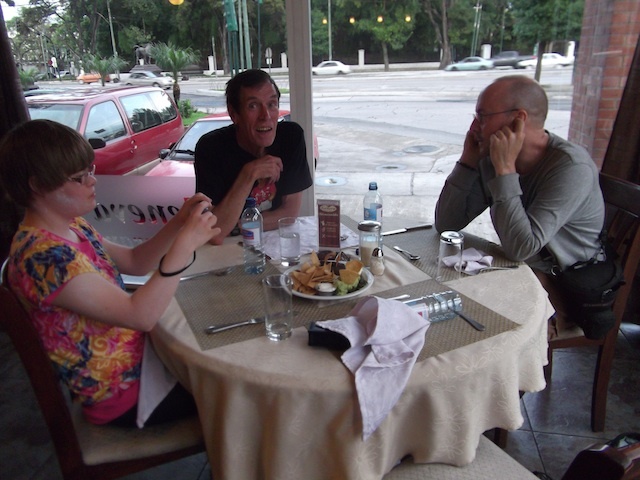 After that we ate dinner at the hotel and then we said `goodbye’ to Paul. There was a guard outside our hotel with a gun. My mom said that it was not scary but it was safe. He smiled at us and waved `goodbye’ to us when we packed up our stuff to go to the airport. Buying tickets at the Zoo. Uncle Jeff takes a picture of me with my mom and Paul. Uncle Jeff helps me learn my camera. 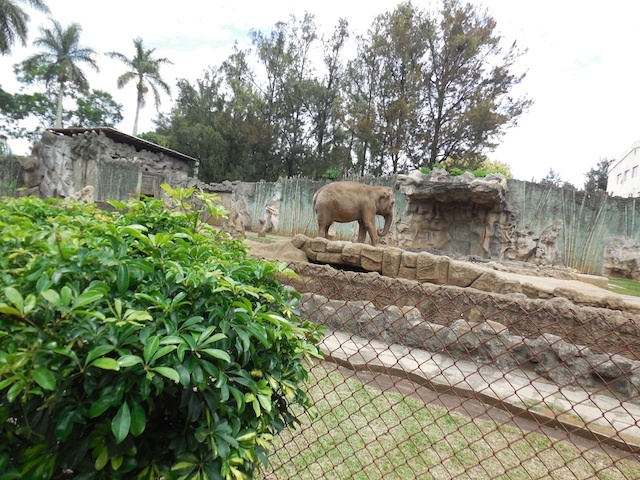 I take a picture . . .
. . . of the elephant. 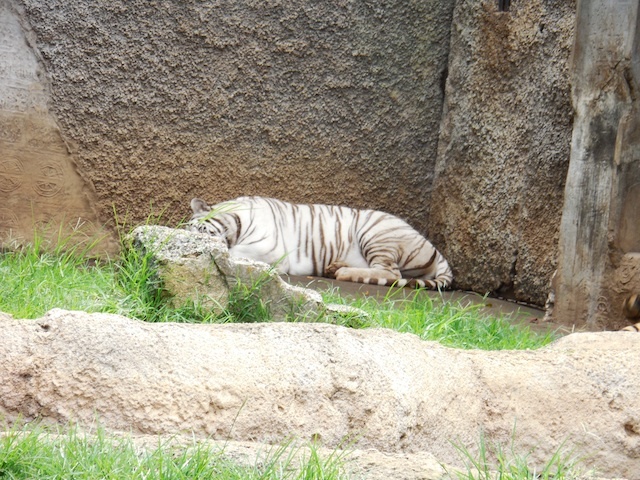 I take a picture of the white tiger. Eating snack mix for lunch at the zoo. 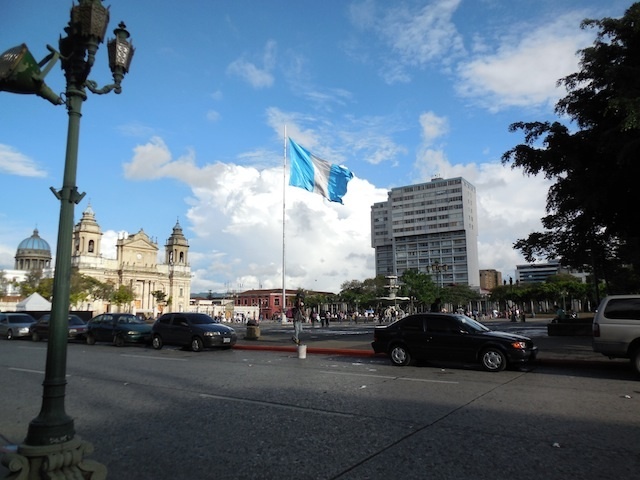 Outside the church with Guatemalan flag. I take a picture of pretty girl. 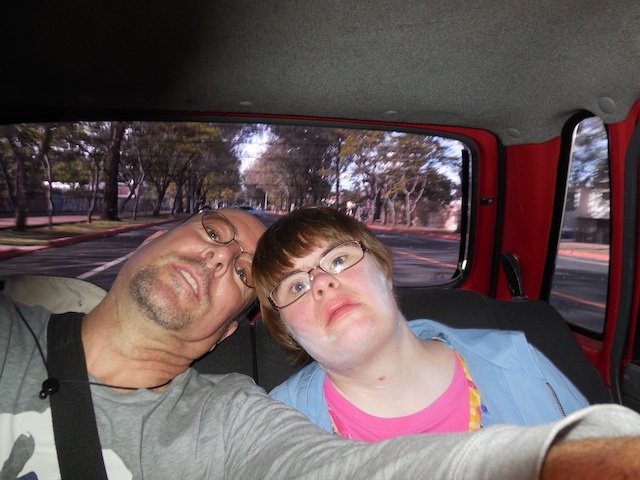 Fooling around with the camera in the back of Paul’s car. 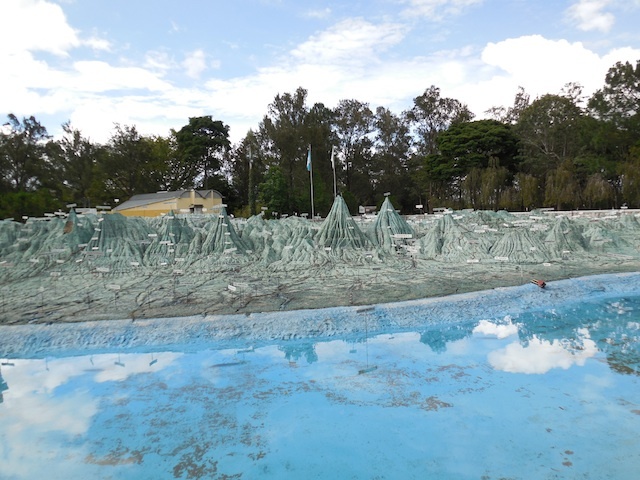 I take a picture of relief map . . .
. . . nice shot. I take a picture of . . .
. . . our first dinner in Guatemala. At the airport we waited for Uncle Jonathan and Aunt Laura, Schyler, Olivia and Bremen. We also met our Casas’ friends who took us to a residence for the first night. We were very tired and so I skipped the shower which was a good thing because my mom said that it was only cold water. 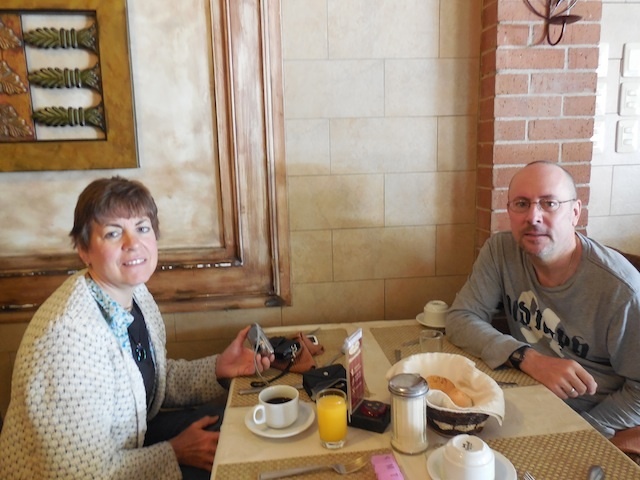 In the morning we had a nice breakfast and walked around the city, San Raymundo. 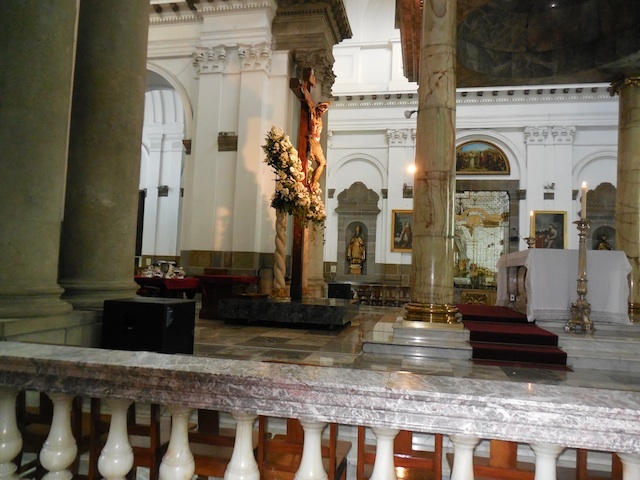 I wanted to go to church but in Guatemala they have market in the morning on Sunday and church in the afternoon. So we went to the market and I almost bought a traditional Guatemalan outfit but it was too expensive so we could not buy it. My mom and I were very disappointed. 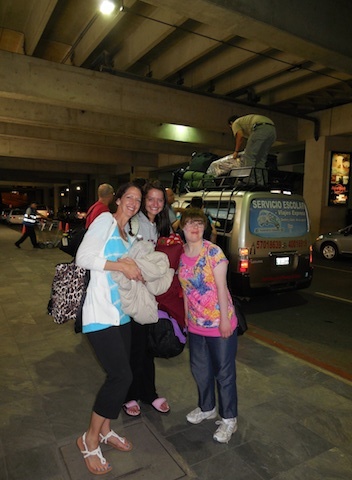 Uncle Jonathan,Aunt Laura Schyler,Oliva and Bremen arrive in guatemala. We circle-up with our leader Brandon for the first of many times. 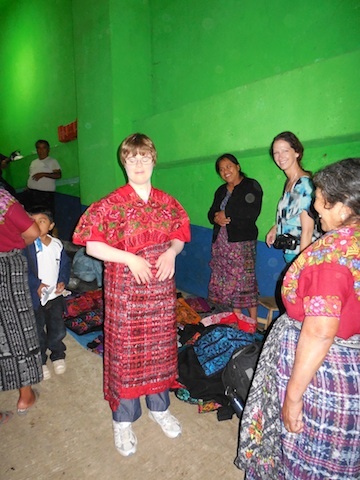 I try on a traditional guatemalan outfit –so pretty. Running to the bus in the rain. Uncle Jeff let me wear his hat. Back at the Residence we had a very very nice lunch and met new Casas’ friends like Jason and the other Jason and Lory from Morning Glory Christian Academy. My Uncle Jonathan gave her some money from a friend in Williston. She wanted to use the money to buy new instruments for the school’s band. She said that we would hear the band play on Friday after our trip to Antigua. Lunch was chicken cordon blu, potatoes, salad and veggies. 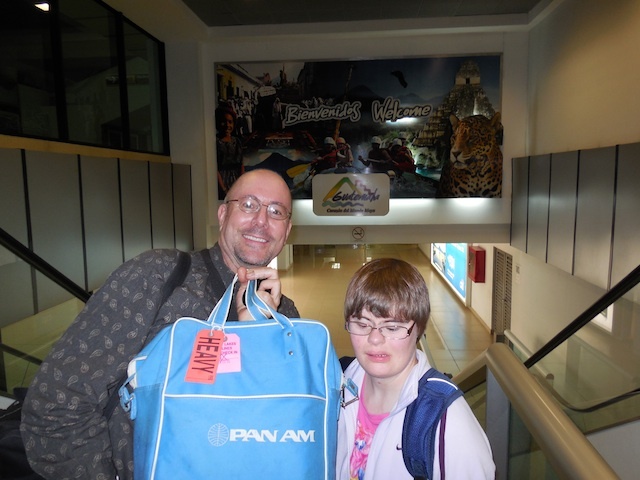 In the afternoon we had to pack up our stuff again for the 3:00 bus to the resort where we would be staying. Well, the bus did not come until 4:30 and by then it was raining. 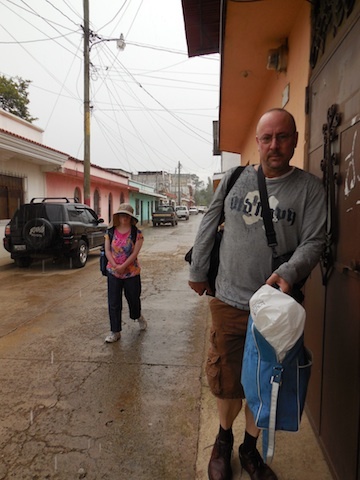 It rains a lot in the afternoon in Guatemala. We ran to the busses and had to find a seat on a very full bus. This is where we met our team members and the other 4 teams that were going to stay at the resort with us. Somehow in all the rush of activity we missed going to church and I was disappointed. We moved into our room: my mom and I stayed in a room with Aunt Laura and Olivia. 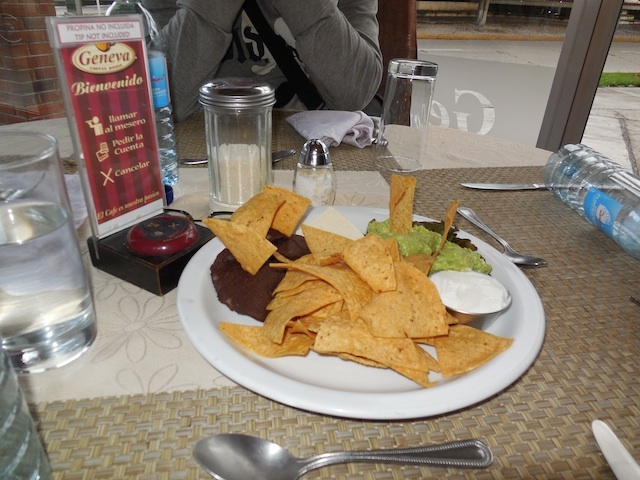 And then we had dinner which was nachos with beans and cheese. We skipped the beans part. Brandon, the leader of Casas pro Cristo in Guatemala talked about the week ahead of us: 6 houses for 6 families would be built by 6 teams! Wow! that’s a lot of workers so he talked about respecting Emmanuel Park, keeping it neat, staying quiet so everyone could sleep, AND not throwing toilet paper down the toilet: `If you forget, and you will forget’ he said, `just dig it out—I don’t care how—hands, mouth, nose.’ Everybody laughed. `Don’t think that it is just one little piece of toilet paper and that it won’t matter because everybody thinks that.’ I already knew about this rule because my mom always came with me to the toilet in Guatemala because she thought that I might forget that rule BUT actually she was the one who was forgetting and having to dig it out! Hah! She used her fingers, very quick AND she washed her hands very well. Dinner at Emmanuel Park Resort. Hanging out with my new friend Leah. So then we brushed our teeth outside with bottled water, laid out our work clothes and went to bed: breakfast was to be at 6:30 and on the busses at 7:30 and then off to the work site!